Peter Tyndall defied nationalist schools of painting and Greenbergian formalism when he emerged on the Melbourne art scene during the early to mid 1970s. His continuing practice, which draws upon dada, conceptualism, minimalism and pop, is defined by a post-modern endeavour to dismantle and reconfigure pre-established notions of the aura of art work, the role of the viewer, and the cult of the artist. This 1983 work characteristically employs Tyndall's device of the suspended yet redundant hanging rods, signifying and ultimately critiquing painting as a high modernist ideal. 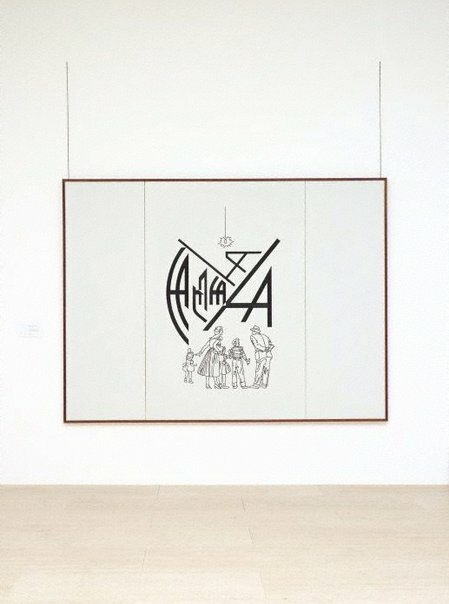 The central panel depicts, in black and white graphic fashion, an image of a 1950s nuclear family (the artist's model for the museum-going public) haplessly inspecting a dynamic, angular logo. 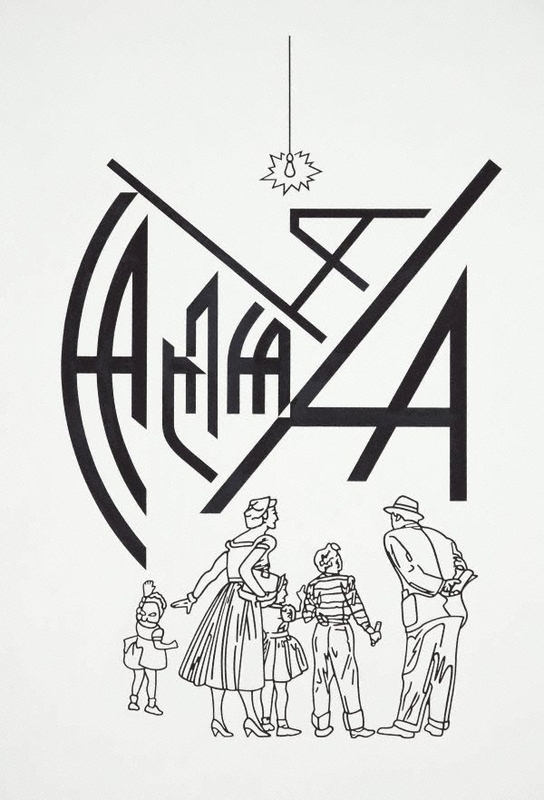 Upon closer inspection this design, clearly indecipherable to the depicted viewers and indeed us at first, reveals itself as a monogram of the artist's trademark expression 'HA HA HA HA HA'. 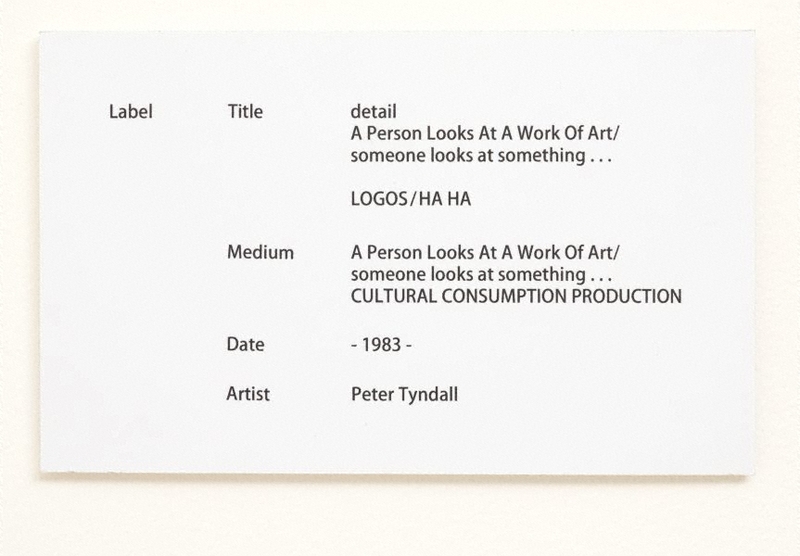 In staging a joke upon which its punch line literally rests upon the disparity between viewer and logo (both the family's and our initial incomprehension, ironically underscored by the hanging light bulb-the universal sign for a 'bright idea'), Tyndall deconstructs the critical enterprise of looking, interpreting and appreciating art. Natalie Wilson and Anneke Jaspers, Foundation Newsletter #22 , 'Curators' and coordinators' reports: Australian art', pg. 6-7, Sydney, Jun 2013, 6.